On August 17, 1969, German-American architect Ludwig Mies van der Rohe passed away. Along with Le Corbusier, Walter Gropius and Frank Lloyd Wright, he is regarded as one of the pioneers of modernist architecture. Maria Ludwig Michael was born on March 27, 1886, the youngest son of the Aachen, Germany, stonemason Michael Mies (1851-1927) and his wife Amalie (née Rohe, 1843-1928). He grew up with his brother and his two sisters in simple Catholic conditions and attended the cathedral school in Aachen for three years after primary school. From 1899 to 1901 he prepared for his professional life as an apprentice bricklayer at a construction company at the Gewerbeschule Aachen. His first job was as a draughtsman for stucco ornaments. His drawing talent had already attracted attention at his parents’ company, where he occasionally worked on the production of natural stone components and tombstones. In 1904, Mies moved to the Aachen architect Albert Schneiders, who was in charge of the local construction management for a project of a Berlin office. Here he met the Berlin architect Dülow, who asked him to go to the capital. In the same year Mies successfully applied to Bruno Paul, with whom for the first time he also worked on furniture designs and attended his lectures at the Kunstgewerbeschule Berlin and the Hochschule für bildende Künste. Here he also met the Riehl couple, who wanted to build a new house and promote a young talent for planning. Through the mediation of a colleague, Mies was chosen, and with Paul’s goodwill he built his first work completely independently in 1907: the Riehl House in Babelsberg in the style of the reform architecture of the Munich School taught by Paul. In 1908, Mies followed the recommendation of his office manager and switched to Peter Behrens, where he was able to further develop his professional skills on major projects. In addition, however, the intensive intellectual examination of architecture in general also began now. Behrens himself belonged to the avant-garde and it was no coincidence that Walter Gropius  also worked for him. In 1912 he left Behrens’ office and accepted an invitation to The Hague, where he worked on a neoclassical building complex as a guest of his clients. Mies returned to Berlin in 1913 and married his girlfriend Adele Auguste (called Ada) Bruhn in April. He opened an architectural office and was commissioned to build a residential building in Zehlendorf, which for the next ten years was the first in a series of his more classic villas in the reform style for upper-class builders. When World War I broke out, Miels was drafted into the army in autumn 1915 and assigned to various construction companies in Frankfurt am Main, Berlin and Eastern Europe. He did not take part in fights and returned to Berlin at the beginning of 1919. 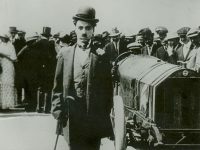 In the following years his marriage fell into a profound crisis and in 1921 the couple separated by mutual agreement. In the following year he extended his surname to include the derivation “van der” and the birth name of his mother to “Mies van der Rohe“. The First World War was a culture shock in Europe as a whole. Its nature and scale revealed pre-war illusions. Many also saw the architecture with different eyes. Few avant-gardists had previously suspected that the enormous scientific, technical and social developments of the 19th century could not be expressed in an architecturally authentic manner with historicising recourse and ornamental cladding. Modern architects were now concerned with a complete reformulation of contemporary architectural theory. Thanks to his experience with Paul, Behrens and Berlage in particular, Mies van der Rohe immediately understood this challenge and faced it, although he certainly did not have the appropriate educational background for theoretical problems. In 1921 Mies van der Rohe took part in a competition for an office building on Friedrichstraße in Berlin. His contribution was not taken seriously by the competition’s promoters because it was too imprecise and unusual. From today’s perspective, this study is visionary, because for the first time all main usable areas were largely variable and the façade was completely glazed. Here is the first example of his “skin and bones” architecture of later years, where “skin” stands for the glass façade and “bone” for the steel structure. In 1923 Mies van der Rohe built his first building in modern design: Haus Ryder in Wiesbaden, a lightly plastered cubic house with flat roof and stylistically close to the Bauhaus. Haus Wolf in Guben from 1926 later shows clear references to the two country house studies and proves its independence in formal expression. In the mid-twenties, several large social housing settlements were built in some cities of the German Reich in the course of the economic recovery after inflation. In this context, Mies van der Rohe realized his most extensive project to date. These were four apartment buildings on Afrikanischen Strasse in Berlin-Wedding, which were completed in 1927. Here he used prefabricated standard components (e.g. windows) to reduce construction costs and tried to achieve good lighting and ventilation of the apartments with the open grouping of the buildings. In 1924 Mies van der Rohe joined the DWB (Deutscher Werkbund) at invitation and was appointed vice president here in 1926. In this function he directed the Werkbund exhibition “Die Wohnung” in Stuttgart in 1927. Part of this exhibition was the model settlement Am Weißenhof (Weißenhofsiedlung) in the district of Killesberg, whose development plan he designed and whose realization he coordinated. In mid-1928, Mies van der Rohe and Reich were commissioned with the artistic direction of the German department of the 1929 World’s Fair in Barcelona, probably mainly because of the great success of the Stuttgart Werkbundausstellung. They also designed some exhibition areas together, and Mies van der Rohe built an official reception building. This almost purpose-free representative building became the main attraction of the entire world exhibition and has since been regarded as one of the most important works of modern architecture: the Barcelona Pavilion. With the global economic crisis from 1929, a period of economic uncertainty also began for Mies van der Rohe. In 1930 he accepted the appointment as director of the Bauhaus in Dessau and began his academic teaching activities. However, the Bauhaus in Dessau was closed for political reasons as early as 1932 by a newly elected city council with a National Socialist majority. Mies van der Rohe then tried to continue the school as a private institute in Berlin, but had to give up because of the increasing political pressure of the new (January 1933) Reich government of the National Socialists in mid-1933, because they did not want to tolerate the Bauhaus because of some sympathies for socialism and generally rejected the cultural concept represented by the Bauhaus. In 1937 he made a trip to the USA, which led him via New York and Wyoming (Project Resort House) to Chicago, where he successfully concluded negotiations with the Armour Institute. 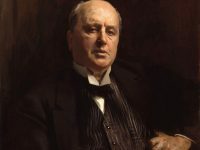 The considerable influence in the institute and the prospect of founding an architectural office in Chicago without any problems were probably decisive for him. He returned to Germany before finally moving to the United States in 1938. In 1944 he became an American citizen. In 1939 Mies van der Rohe founded his architecture office in Chicago and, after the merger of the Armour Institute and the Lewis Institute to form the Illinois Institute of Technology (IIT), was commissioned one year later to plan the new campus of this university. He designed a rectangular, green collection of low-storey institute buildings with visible steel structures and brick and glass infills oriented towards Chicago’s development structure. Over the years, he built fifteen of these buildings himself, including the Alumni Memorial Hall in 1946, the St. Savior Chapel in 1952 and the Crown Hall in 1956, which is regarded as one of his masterpieces in the USA. 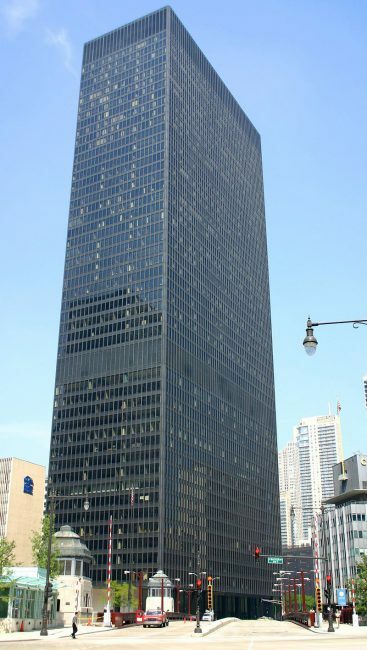 In 1954 Mies van der Rohe was commissioned to design his first office tower, the Seagram Building in New York, in 1958. The way in which the building was integrated into the urban situation was completely new and can then be found in a similar form in three projects: the Chicago Federal Center of 1964, Westmount Square Montreal of 1968 and the Toronto-Dominion Centre of 1969 In all cases, a public square in the middle of the city and surrounded by high-rise buildings is kept free, which merges almost seamlessly into the fully glazed ground floor zones of Mies van der Rohe’s buildings and thus connects them to each other and to the urban space. 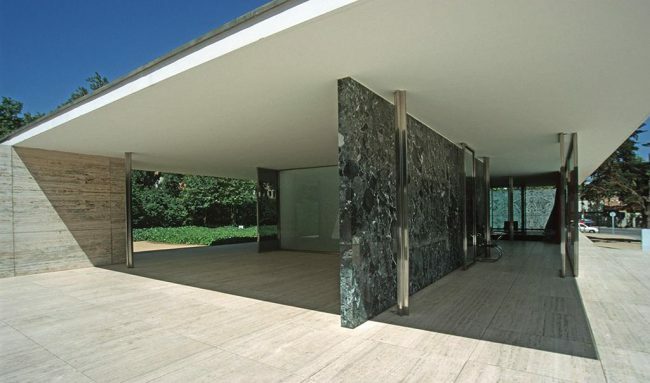 In the last years of his life Mies van der Rohe was honoured with many awards. Honorary doctorates, gold medals from architectural associations and the highest civil orders of the Federal Republic of Germany and the United States of America are among them. The orders for his office became more and more numerous, he left much to his longtime employees and a grandson, who was an architect. In his will he ordered the continuation of his office under his name for five years for the completion of the buildings begun with him. 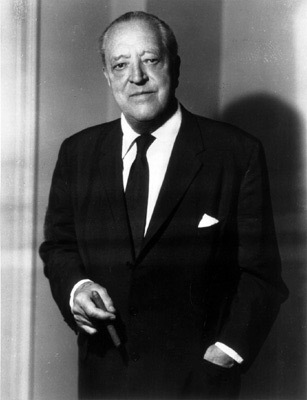 Mies van der Rohe fell ill with esophageal cancer at the end of his life and died of pneumonia within three days in the summer of 1969 at the Wesley Memorial Hospital in Chicago at the age of 83.